In our last post we built our first measure to make calculated buckets for our data, found here. For this tutorial we will explore the power making measures using Data Analysis Expressions (DAX). 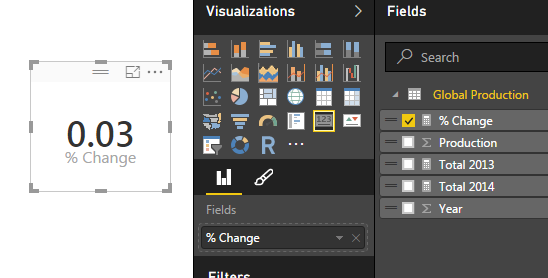 When starting out in Power BI one area where I really struggled was how to created % change calculations. This seems like a simple ask and it is if you know DAX. Click Close & Apply on the Home ribbon to load the data into the Data Model. Next we will add a table to see all the individual values for each year. 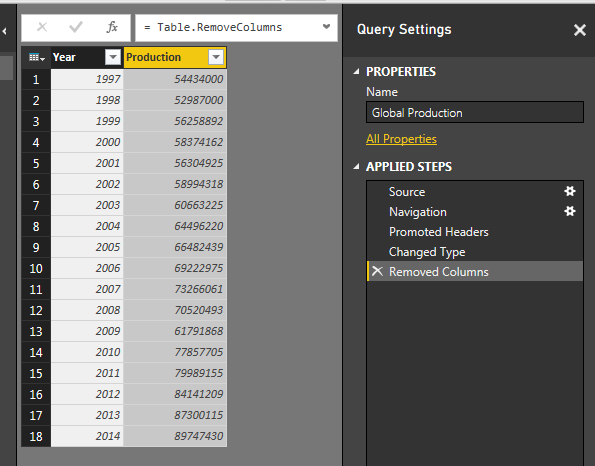 Click the Table visual to add a blank table to the page. 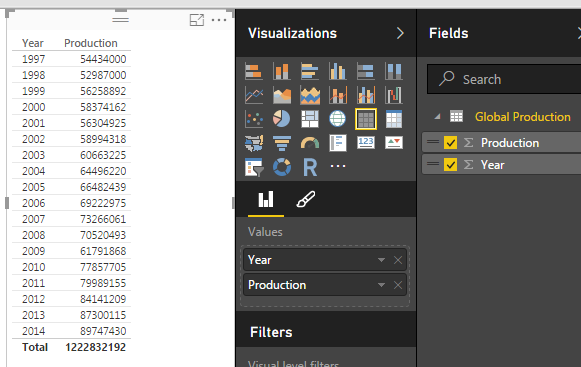 Add Both Year and Production to the Values field of the visual. Notice how we have a total for both the year and production volumes. 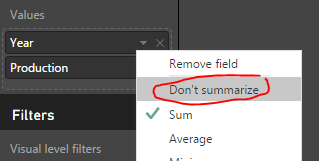 Click the triangle next to Year and change the drop down to Don’t summarize. Now that we have the set up lets calculate some measures with DAX. Click on the button called New Measure on the Home ribbon. The formula bar will appear. We will first calculate the total production for 2014. We will build on this equation to create the percent change. Use the following equation to calculate the sum of all the items in the production column that have a year value of 2014. Note: I know there is only one data point in our data but go alone with me according to the principle. In larger data sets you’ll most likely have multiple numbers for each year, thus you’ll have to make a total for a period time, a year, the month, the week, etc.. This yields a measure that is calculating only the total global production in 2014. 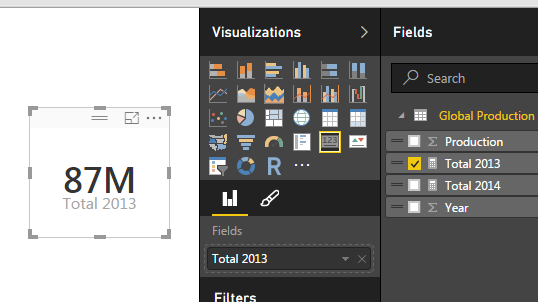 Add a Card visual and add our new measure “Total 2014” to the Fields. This shows the visual as follows, we have 90 million vehicles produced in 2014. This creates another measure for all the production in 2013. Below is the Card for the 2013 Production total. And for my final trick of the evening I’ll calculate the percent change between 2014 and 2013. To to this we will copy the portions of the two previously created measure to create the percent change calculation which follows the formula [(New Value) / (Old Value)]- 1. This makes for a long equation but now we have calculated % change between 2013 and 2014. Wait you say. That seems really small, 0.03 % change is next to nothing. Well, I applaud you for catching that. This number is formatted as a decimal number and not a percentage, even though we labeled it as % change. 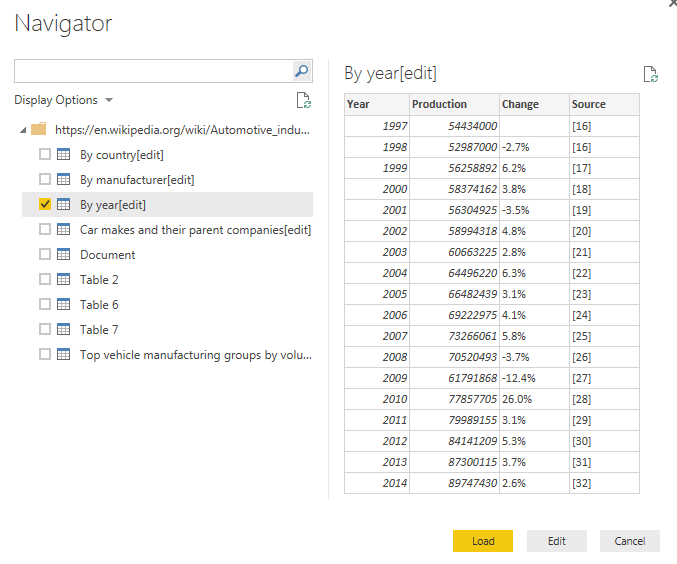 Click the measure labeled % Change and then Click on the Modeling ribbon. Change the formatting from General to Percentage with one decimal. Notice we now have a percentage. Thanks for working along with me. Stay tuned for more on percent change. Next we will work on calculating the percent change dynamically instead of hard coding the year values into the measures. Please share if you liked this tutorial. I have been getting a lot of questions about this exact tutorial. I will add it to by back log. Thanks for the suggestion.